Established in the year 2010, We Senior Paper Packaging Machinery Manufacturing Company, are one of the leading companies engaged in Manufacturing and Exporting a wide range of Boxmac Corrugation Machine, Reel to Sheet Cutter Machine, Sheet Pressing Machine, Flexo Printing Machine, Punching Machine, Lamination Machine, Paper Bag Making Machine, Die Cutting Machines etc. Our range caters to the requirement of corrugated boards, boxes, and another paper-based packaging. To make sure that our clients get the best, we conduct various stringent quality tests which are executed by our quality inspectors with the help of advanced testing facilities. Moreover, being a client-oriented company we offer our clients with customized solutions to meet their varied requirements. Owing to the constant hard work of our professionals we have been able to garner the trust and hold of our clients all across the globe. We are working under the able guidance of our mentors Mr. S. Karam Singh Thind and Mr. Kawaljit Singh Thind we have been able to carve a niche for ourselves in the market. Their rich business acumen and vast experience has led us constantly to the pinnacle of success. Quality is of great importance to us and we ensure that it is adhered to at every step. The stringent quality control process ensure that our wide range of corrugated board, box making machinery and other allied machines itself speak about the quality and durability attributes. Further, our quality controllers are always vigilant and ensure that only the impeccable range of machinery should leave the factory premises. During all the processes, our experts and analysts remain thoroughly vigilant. This is done to ensure that there is no malfunctioning during the production process, and the remains completely safe. We also pay close attention during the packaging and storage of our range, since these needs to be handled with extreme care and precaution till they get delivered at clients. Our wide range of corrugated board, box making machinery and other allied machinery has become a preferred choice of various well known paper and packaging industries. Our knowledge and team efforts help us in offering these in sync with international quality standards. Owing to our quality range of corrugated board, box making and other allied machines, we have emerged as one of the renowned companies in the market and have been able to serve various industries such as paper and packaging in an efficient manner. Our high quality principles, transparent deals and affordable prices have also enabled us in garnering the trust and respect of our esteemed clients. 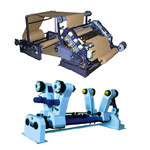 Besides offering superior range of corrugated board, box making machinery and other allied machines, one of the major added advantages that we offer our client’s is our effective after sales support, which consists of training about the operation of these machines to installation, maintenance & many more. Furthermore, if any client wishes to consult us regarding any query or service, they can contact us without any hesitance & we assure prompt response and solution to their concern. We have framed a team for keeping a check on the quality process. Our second team is engaged in managing and controlling the production operations and work in complete coordination and harmony with each other. We have sourced the best manpower from all over India and have created our team of technical professionals. We also conduct seminars and training sessions for new entrants to enhance their productive efficiency as well as increase the productivity ratio and minimize the wastages.